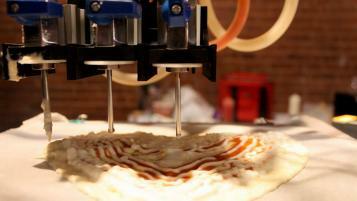 One Silicon Valley startup called BeeHex has invented a bot that can 3D-print and bake a pizza in six minutes. The inventors received a $125,000 grant from NASA to develop the device in 2016. In February, TechCrunch reported that it raised $1 million in seed funding to launch its first product, a pizza printer called the Chef 3D. Starting later this year, the Chef 3D will appear at select theme parks, sports arenas, and malls. Compared to human workers, the robot is faster. Only one person is needed to work the machine. Source: Business Insider.